Calling card of William D. Talcott of Anson, Maine. He was presumably William Deane Talcott (1858-1936). 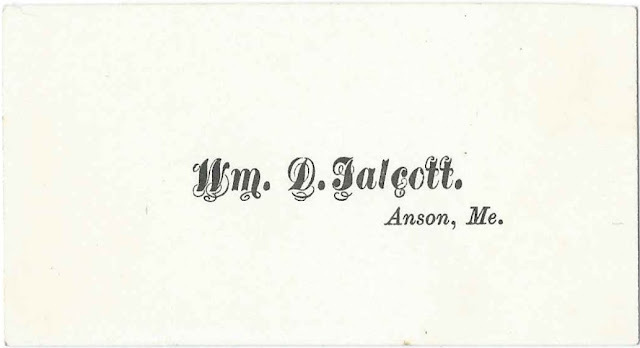 As noted above, he may have been William Deane Talcott, who was born about May 1858, son of Howard Winslow Talcott and Mary G. (Deane or Deanne) Talcott. On December 6, 1879 at Anson, Maine, William married Bettie Parker Davis, daughter, I believe of John D. Davis and first wife Emily (Spooner) Davis. At some point after 1880, William and Bettie moved to New Vineyard, Maine, where they farmed and raised at least one child, daughter Edith Mary Talcott, who would marry Cecil Sumner French. William died in 1936 and Bettie in 1956. They're buried in the New Portland Cemetery at New Portland, Maine. The cemetery was apparently named West New Portland Cemetery at one time, in accordance with a record from the Faylene Hutton Cemetery Collection, 1780-1990. If you have corrections and/or additions to the information above, or if you feel that William D. Talcott was another person, please leave a comment or contact me directly.